`Just like that, I wasn't a twin anymore... It broke my heart that I hadn't been able to save her, but I could keep a part of her alive by finishing what she'd started' The bond between twins is so strong it can never be broken - even in death. When Melissa lost her twin sister Nicole at just 21, she wondered how she would carry on without her soul mate. Her other half. The fun-loving, courageous girl who had always been by her side. Determined not to let Nicole's illness destroy them both, Melissa vowed to complete the bucket list her sister had written but never completed. From 'do a bungee jump' and 'fart loudly in a lift', to 'go dancing in rain' and 'get married', the list includes items that are at times deeply touching, challenging, or downright ridiculous. 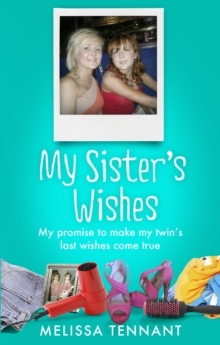 My Sister's Wishes is the moving story of an extraordinary love between two extraordinary sisters.